Milk Thistle | Become Healthy or Extinct! 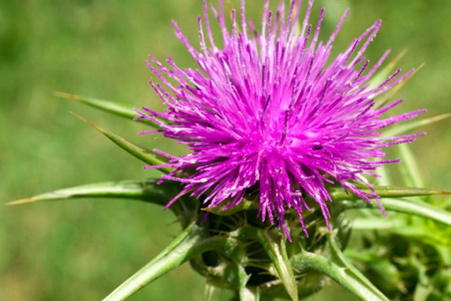 Milk thistle has other common names include cardus marianus, silybum marianum, blessed milk thistle, Marian thistle, Mary thistle, Saint Mary’s thistle, Mediterranean milk thistle, variegated thistle and Scotch thistle. This species is an annual or biennialplant of the Asteraceae family. This fairly typical thistle has red to purple flowers and shiny pale green leaves with white veins. Originally a native of Southern Europe through to Asia, it is now found throughout the world. This herb improves liver function and assists in the detoxification process, which enables better digestion. Steep a tea bag of milk thistle in a cup of hot water for 10 minutes. Drink this twice daily to notice an improvement. Milk thistle has also been known to be used as food. The roots can be eaten raw or boiled and buttered or par-boiled and roasted. The young shoots in spring can be cut down to the root and boiled and buttered. The spiny bracts on the flower head were eaten in the past like globe artichoke, and the stems (after peeling) can be soaked overnight to remove bitterness and then stewed. The leaves can be trimmed of prickles and boiled and make a good spinach substitute or they can also be added raw to salads.